Members of the Lambda Upsilon Lambda fraternity present to high school students attending the Juvenile Urban Multicultural Program (J.U.M.P.) leadership conference on Saturday, Nov. 11. Approximately 75 students attended the conference, which introduced students to college life and provided information on the college application process. In middle school, Edirka Alcantara visited Binghamton University and left with one goal: to go to college. Now, Alcantara, treasurer of the Juvenile Urban Multicultural Program (JUMP Nation) and a junior majoring in economics, helps in planning events similar to the one that convinced her to pursue higher education. Approximately 75 high schoolers visited BU on Saturday, Nov. 11 as part of JUMP Nation’s annual leadership conference to talk with current students, see the campus and learn how to overcome challenges low-income and first-generation students often face when applying to college. The day serves as one of the most important events of the year for JUMP Nation, a nonprofit organization that works to increase the enrollment rate of low-income students to colleges like BU. The organization aims to assist students from schools in New York City and the local community, providing students information about higher education and helping them through the application process and in their transition to campus. Marquis Byfield, a 17-year-old student at the Frederick Douglass Academy in Harlem, said the networking helped him make his decision to apply for college, and that BU was one of his top schools. “I’ve never had an experience like this before, with diverse people, so I respect it,” Byfield said. 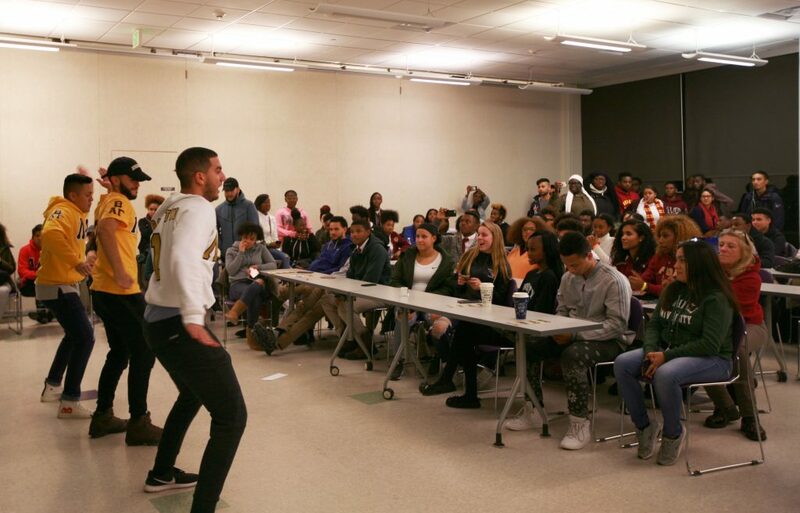 JUMP Nation also serves as a support network for students of color on campus, working to ensure that new students are well-adjusted to college life. According to Alcantara, events like the leadership conference are important for students coming from difficult backgrounds, who may have multiple obstacles on their path to college. This year’s leadership conference included a presentation on BU’s Educational Opportunity Program and the Men of Color Scholastic Society. Additionally, students were able to attend an organization fair and talk with leaders from many of BU’s multicultural groups. A tour was also offered, and students listened to lectures that outlined the college application process and ways to do well in college. Jeannine Brown, a science teacher and college adviser at the Frederick Douglass Academy, said the connections made at the conference are invaluable. “It’s good for students to see students that come from where they come from and see sort of a path,” Brown said. Cory Morrison, a 17-year-old student at Binghamton High School, said the conference helped to change his thinking about the college experience. In addition to the leadership conference, an annual JUMP Weekend is held during the spring semester. The four-day event brings eighth-graders to campus and pairs them with college-student mentors.